Make no mistake — lovers of art reside here. 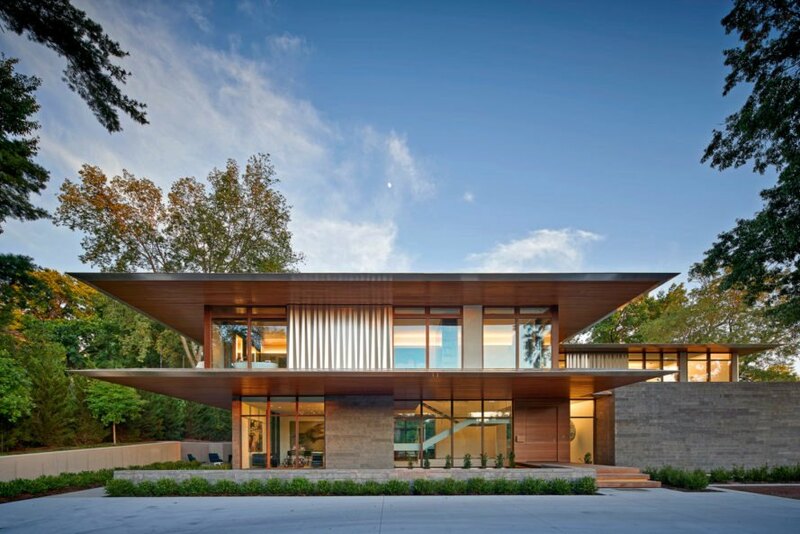 Designed and built by Hufft, The Artery Residence is gorgeous, eco-friendly and just as art-focused on the inside as it is on the outside. 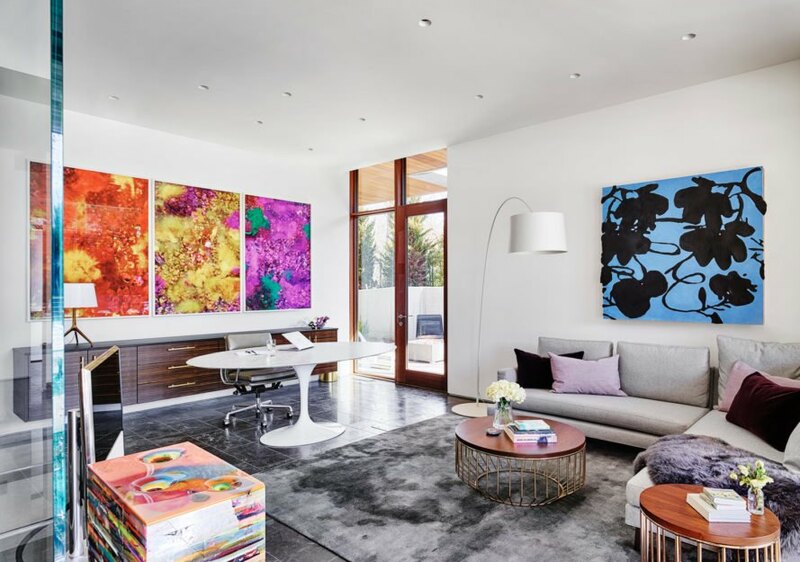 The owners, prominent contemporary art collectors, wanted a blend of home and gallery that allows them to live comfortably while displaying their impressive art collection in a modern way. The designer clearly made the space as a unique backdrop for the art installation in mind, with blank, clean walls enabling the owners to rotate and move the art as they please. Floor-to-ceiling windows in the master bathroom allow for views of nature near the tub, warm wood accents, mosaic tiles and quartz counters. The home gets its name not only from the art-centric design, but from the three main “arteries” that connect the structure to the gallery. In this way, each part of the home is connected to the art. There are two guest suites, one that sits poolside, and another that extends dramatically over a limestone wall. Made of cedar, aluminum and limestone, both the exterior and interior invoke sleek, clean lines. 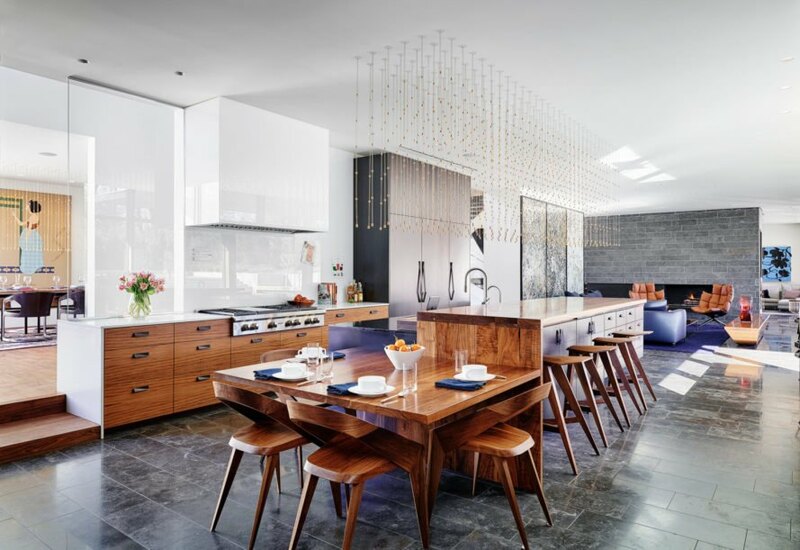 In the kitchen, a custom-made modern chandelier with custom island and wooden bar top, with a more formal dining room are visible in a separate area. The Artery Residence is an excellent example of sustainable architecture. The stone floors act as an eco-friendly light absorber, along with big open windows that let that natural light in. Throughout the house are installed large overhangs that hang over the outer structure offering protection from the sun. 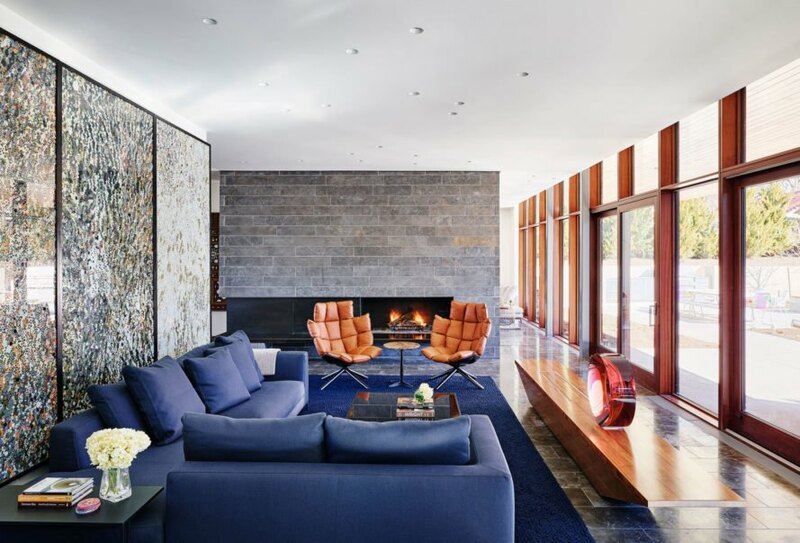 In efforts to lessen the environmental footprint of the house, the architect incorporated geothermal, active solar and LED lighting into the design. The landscape, designed by 40North, was installed with sustainable garden growth in mind with natural vegetation and permeable surfaces. 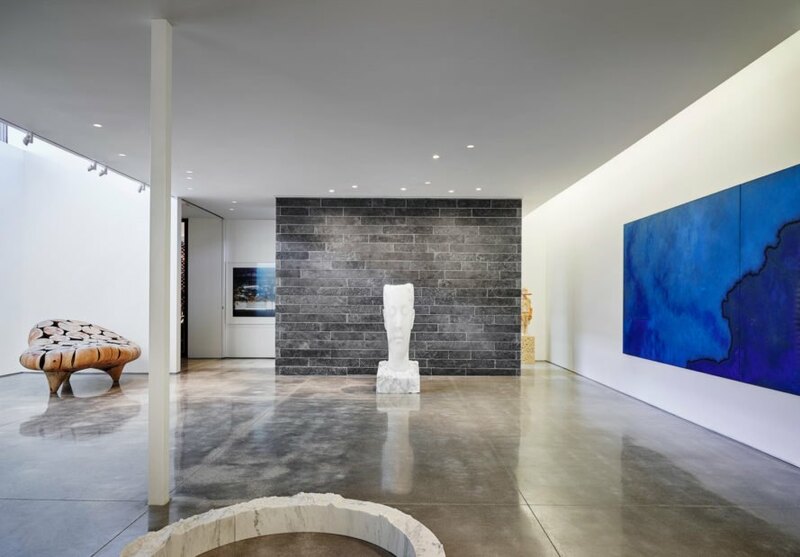 Throughout 10,650 square feet of living space, thoughtful spaces cut into the floors and screened wooden stairs ensures the central visibility of the owner’s art collection. Also part of the home are matching office spaces and three separate bedrooms with their own en suites. The art doesn’t stop when you reach the outside, either. Striking sculptural pieces are respectfully spread throughout the grounds outside the home, along the terraces and near the pool deck. One of the large entrances that opens to the gallery allows for the loading of large art pieces and for visitors to enter without disturbing the occupants of the home. The home owners are contemporary art collectors. The gallery-like residence is a piece of art in itself. Large white walls can be found throughout the home with floor-to-ceiling windows. The home has two his-and-hers office spaces. Outdoor sculptures add a dramatic appearance to the home. The home's sitting area has a built-in fireplace. The dining space feature bar seating and wooden accents. The kitchen features a custom built chandelier. The home was built with energy efficiency and eco-friendly components.